This is off topic, but it's funny. Consider: The base model of Land Rover's top-of-the-line Range Rover SUV costs $89,500. The base model of Toyota's RAV4 SUV costs $24,500. However, the RAV4 comes standard with far more features than the 3.6X more expensive Range Rover. To get the features of the Range Rover up to the standard of a RAV4, you have to spend half the price of a base RAV4 just on options. So just to spell this out, after already spending ninety grand on a car, people who buy Range Rovers have to spend yet more just to get the features that a car that costs less than a third as much already has. "If everything costs extra, how do people stand for that? How do they put up with it?" car reviewer Doug DeMuro asks. Well, here's how: "Land Rover knows that the people who buy these, they're not going to consider a RAV4. So they'll never know that the RAV4 has some of these features standard. The people who get these cars just sort of live in the world of these cars, and they don't really know what they're missing out on, and generally they don't know that they're paying more for features that a lot of 'regular cars' have standard, or [as] cheap options." Really? Not sure that's likely. Or even possible. (Could it be?) But the idea made me laugh. I'll let you draw a comparison to cameras if you want to. :-) You're on your own there. ADDENDUM: I should add that all of the very rich people I've known (not that many) all drove nondescript cars. That included Nelson Rockefeller, with whom my father had a glancing acquaintance when Rockefeller was Vice President. VP Rockefeller was chauffeured in a nondescript middle-blue, mid-level American sedan. The only difference is that the back windows were tinted and he had a gooseneck reading lamp on the back deck so he could work. His chauffeur dressed in street clothes, not livery. He was thus indistinguishable from thousands of other Washington functionaries who toodled to and fro their offices in similar rigs, hard at work in the back seats. Jeron: "Re '...they don't know that they're paying more for features...' In other words: the inability of a person to understand that other people are different from himself, and probably have other priorities and other goals when they make purchase decisions. Price/feature ratio is a parameter to assess products, nothing wrong with that. But declaring it the only relevant parameter is absurd. If you want an analogy: imagine a reviewer claiming everybody is ignorant who doesn't eat fast food, because that's the best price/calorie ratio." Mike replies: No, he acknowledges why people buy Range Rovers. Start the linked video at 7:24 and you'll see. And Doug usually reviews much less sensible cars than the LR RR—exotic cars and supercars and the like. The point is simply that cars that cost so much used to come with everything standard; that was one of the reasons why people paid so much for them. Now it's the opposite—car companies use options as a way of soaking (i.e., further exploiting) their customers, and the customers don't seem to know enough to complain. As one commenter to the video noted, you can add $50,000 in options to a $40,000 BMW, which is at least absurd, if not predatory. Tom Dills: "Most of the Range Rovers here in North Carolina don't even come with turn signals. At least not that I can tell...."
Igor: "You could have made it on topic if you wrote about a Leica and some other camera." Tom Duffy: "The price of options on a supercar or even a BMW always amazed me. For instance, there was the day I realized that the 'ceramic brakes' upgrade on a Ferrari cost $32,000. About the same price as my entire 2009 Pontiac G8 GT." Mike replies: A G8...that's a really exclusive car! Never understood why it didn't sell better. I have a very exclusive car too—Acura only sold 17,854 ILX models in the US in 2014. Quite unpopular, and I seldom see another one. I can't find figures for how many of those were the sportier 2.4 liter, only sold with the manual transmission, but I know it's a small fraction of the overall number. The car was "refreshed" for 2015 so only the 2013s and 2014s look like mine. Your G8, as I'm sure you're well aware, is more exclusive than that. Speed: "If you spend some time among 'car people' you'll learn that configuring cars on line is as popular with them as watching YouTube videos is with cue sports fans. Porsche will be happy to sell you 'Decorative valve sleeves (in black with colored Porsche Crest), set, comprising 4 cover sleeves' for $64. Why aren't they included with the car? Because they are also available silver-colored with colored Porsche Crest and silver colored with monochrome Porsche Crest. Also available are Wheel Center Caps with Colored Porsche Crest for $190. Porsche people notice these things. For no additional cost Porsche will include 'Deletion of Model Designation.' The people who count will know which model you're driving." I recently saw the window sticker on a customers fairly new Land Rover Sport. The base price was around $104K if I remember right. The option package they had bought called "The Autobiography" was a $38K option!!!! THIRTY-EIGHT THOUSAND DOLLORS!!!!!! It's just mad. Should it be that Canon is the Range Rover of mirrorless cameras? The cameras on the market today have many, many features in which I have no interest. It would be nice if we could customize down, and pay less for a camera with fewer features. Fuji comes close with the x-t30 as a down-market version of the x-t3, but they removed weather resistance which I would definitely keep and left in a whole lot (video features, in particular) that I would happily toss. I know that given the current (mass) production processes, this can't be done (inexpensively), but a guy can dream. For some people, buying a car is a statement about what they can afford, and what it says about them. The more the options cost, the more they can one-up their fellow devotees. Car companies know their customers. A Range Rover is a luxury item, of course, and as such costs more than a functionally equivalently non-luxury item. Part of the joy of ownership must be that it is a luxury item... And in the case of the RR, it is also very functional - if I had to do some serious off-roading I'd probably rather do it in a Rangey than in a RAV4. I actually imagine that many Range Rover drivers are familiar with the RAV4 and similar vehicles. It's not about the functionality, it's about the cachet. What's interesting is how the Range Rover became a luxury item. Originally they weren't - they were intended as replacements for the classic Land Rover; the original base model Range Rover had no seats in the back (the space was for putting sheep or fodder in, you see) and had vinyl floors, so it could be hosed out (because of the sheep...). But various Japanese manufacturers started making very functional and cost-effective 4x4s - especially the Toyota Hilux, there was a Nissan or two, and others, and they all starting destroying Land Rover's traditional market. So they responded my adding comfort to the new model, the Range Rover, and to their surprise found that these luxury models sold very well. They're sometimes referred to in the UK as 'Chelsea Tractors'. Exactly! As soon as I saw Doug’s video the other day the same comparison with certain cameras came to mind! I'm car shopping in a desultory way, which means I'm looking at ratings magazines and on-line ratings services. I saw a British list from 2018 in the Daily Mail in which Range Rover's Land Rover was next to last for reliability, ranking only above...Tesla S. (But there are so few Teslas in Britain that the low ranking might be kind of phony.) Of the ten most unreliable cars in the British poll, four were Land Rover products. But, when it comes to accessorizing, the same is true with Porsche. You *can* buy a Cayenne for $70K, maybe, but to get as comfortable as you'd be in a top-end Rav-4, I think you might have to go to 90K+. I saw a Rav-4 at our Coop grocery store yesterday, and it was bright and shiny and quite the handsome truck, I thought. In that particular line of vehicles (mid-sized and large SUVs) I've seen several that ranked the Audi at the top, rather than the Land Rovers, Porsches, etc. To state the obvious: Bang for the buck isn't really the main concern for Range Rover customers, they are buying the cool car they want. But people with a RAV4 budget think the Range Rover customers are uninformed or just plain silly to pay that much when according to the spec sheet the RAV4 is clearly better. See also PC vs. Mac hardware. I'll refrain from low-hanging camera comparison. Most of those "features," are infotainment systems. Which, BTW, often scupper reliability ratings of perfectly drivable, comfortable, and capable automobiles. There are some things you buy as appliances- you don't care about how well it does what it's meant to do, just so long as it does it. Which is why most people will buy a RAV4 over a Miata, even though they're roughly the same price. The "features" of each are not so much "more or fewer," as they are different sets. The same goes for the Range Rover. The seats in a RR are light-years ahead of the best the RAV4 can offer, which, for me, and many people, far outweighs if the car has Apple CarPlay™ and a radar lane-keeping backup camera Ferengi Dingus System™. One of the Miata's main features is simplicity. It does its thing, and it does it very, very well. As Mies van der Rohe said, "Less is more." My Fujifilm X20 has more features than my Leica M9-P, but it's not as fun to use, more complicated, and less connected to me as a tool. Sometimes, you just want a hammer. Even if it's more expensive than the multitool with more features. I look at Leica Q's constantly, they-are-flat-out-GORGEOUS... and Expensive; even though my GR gives me pronounced advantages in: size, weight, "invisibility," cost and depth of field. Once my husband had a business trip and they made reservations at a very fancy hotel. Every little thing was extra. Parking was extra. Coffee was extra. Internet was extra. A continental breakfast was $12 per person. I kept looking across the street at the Days Inn, where all of that came with the much lower room price. We had to pay for all that, as he didn't want to offend them by making his own more sensible reservation. This has nothing to do with cameras, but maybe it is possible to be that blissful? Like comparing a crop sensor camera to an MF camera. Wildly different sizes and "horsepower". Put all the special features you want on a µ4/3 or APS-C camera, and it still doesn't have a big sensor, if that's what one needs/wants. The comparable Toyota is (or was?) the Land Cruiser. There are also smaller Land Rover models, possibly more comparable to the RAV4. I know no details about either, other than seeing them on the road. I did check out an RAV4 years ago. It was quite a small vehicle. I have no knowledge, nor wish to have any, about the details of SUVs. When you are buying these cars, very little of what you are paying for is for the 'utility' part of the equation. The folks who buy them are less concerned about value than they are about wanting to drive a car of a certain exclusivity. I was a relatively early adopter. In the late 1990's my wife wanted an SUV so I suggested the Range Rover. She drove it, she liked it, we bought it. But after about a year we had experienced a number of quality control issues, and virtually every service was over $1k. The last one of which was the straw that broke the camel's back and she refused to take the car home, She traded it on the spot for a small Mercedes sedan, (the dealer sold both) and has been telling folks how terrible a car her Range Rover was ever since. I think they have improved quite a bit in the intervening years, but what hasn't changed is that , like Rolex, or Louis Vuitton luggage they are Function Plus 'Jewelry Value" items So comparing them on function and features alone never works. If you are buying fir transportation, the RAV4 is clearly a better value, it's just that not everyone wants the value option. The cost is irrelevant. The people who need a Range Rover to fit into their peer group would never buy a RAV4. They are not the kind of people who buy a car only for what it does or how well it does it. Humans seem to crave social status, and Range Rovers and Leicas are just 2 different ways of showing their status. Sort of like buying your kid's way into Harvard or knowing which brand of shoes is in this season. Since when has our culture rewarded what is truly important. Land Rover has discovered Porsche's trick … find out how much money the customer has and get it all. People buy RAV 4s with their own money. People (in the UK) buy Range Rovers with company money. Shareholders look at the list price of their company chairman's car; they don't get to see the cost of the extras. Anyone who can afford to run a (new) Range Rover isnt worried by the purchase cost. I'm not sure it's a valid comparison. It's a bit like saying "my digicam has a lot more features than your Leica", or "my Casio has a lot more features than your Rolex". Both might be true, but have to be weighed against why people buy Leicas, or Rolexes, or Range Rovers. The buyer may be interested in different core capabilities, or may even be actively disinterested in a long list of features of marginal value. Mike, you could have made it on topic if you wrote about a Leica and some other camera. Range Rover and other luxury vehicles are status vehicles, just like Cartier watches are status jewelry timepieces and, well, you get the idea. Range Rovers have nice interiors with leather seats, wood accents, plush carpets, but they are not reliable and are poor values in regard to depreciation. All that extra money purchasing optional features for a Range Rover compared to a Toyota may be lost in depreciation in the first one to three years, which is a double liability of sorts. People who are looking for status don't really care. Unfortunately, in some communities, status plays a role, equating what you drive with how successful you are. This may be important if you are a realtor or an investment advisor. I even had one physician tell me that members of his church would not think he was a good physician if he did not drive a Mercedes Benz. The tragedy is when people lie and cheat, and take advantage of others, so that they may be rewarded with status symbols. The worst part is that Range Rover/Land Rover once again finished near the bottom in the Consumer Reports yearly survey. They are badly made, but, oh those seats. Veblen goods. When Dan Neil reviewed some high end Rover, he stated outright that he tried his damnedest to find this car's limit, to crush it, to test it and find it wanting. He failed, and was forced to admit that it was a heck of a car. You're not *entirely* paying for the marque. These are legitimately good vehicles. It's simply not the case that cars which cost a lot used to come with all the bells & whistles as standard. I have a close relative who owns an extremely distinguished vintage sports car (perhaps not the most distinguished there is, but the case is arguable). I don't know what bells & whistles these cars came with when they were new, but certainly they did not come with bodywork: that was something you would have to provide yourself, via a coachbuilder. And no, they were not cheap. Well, you might argue that things were different then (remember: a vintage car is at least 89 years old). But not really: because you haven't really understood what people who buy really expensive cars want. What they want is a bespoke car: a car which is built for them, to their requirements, and is not like any other car. And they don't, really, care that much what it costs, because the whole point of being rich is that you stop worrying about money (even if, secretly, you do). If the car you have built for you is not, well, the car you have built for you then it's not a car you would want to be seen in. The sort of people who drive cars which come as stock with all the bells and whistles are the sort of people who have bought all their own furniture. "If you have to ask about the price,…"
A Veblen case. For those for whom "quality" and "class" come with a very high price tag, the comparison is meaningless. Let the rich enjoy their wealth; it even gives us poorer members of society a sort of giggle, a nervous tick that half-hides our envy - if we have it. Better to work at what you enjoy than to work to be rich, and if you do get rich doing what you enjoy, then that's wonderful. To get rich and know you hated the work that made you rich means a life wasted. However, if anything is as good as anything else to you, and it doesn't matter what you do to earn your living because a job is just a job, then if you opt for getting rich, that has at least given your life purpose, whether you achieve that goal or not. In the end, we need the rich to need the things that we need to make to earn our own crust; it's all interconnected. At the very least, it's nice to see a Ferrari in a world of ugly quotidian fare. Of which I consider Range Rover et al. to be a part. SUVs are the most hideous automotive designs yet: blobs. IMO it's very simple: you have a price of car and a price of options. You can sell them bundled and you can sell them separately. RAV4 sells them only as a bundle. RR sells them separately. You have to compare $24K RAV to $(90+45)K. There is nothing in Toyota line to compare $90K RR to -- the "unbundled" RAV does not exist. If someone is predatory, then it is Toyota, who forces EVERYONE to pay for their car bundled with all options: there's no way one can buy a $16K barebones RAV4. [So what you're saying is that the RR is really a $102k car that they magnanimously give you the choice of buying stripped down for only $90k? It's funny, Range Rovers and Land Rovers used to be true off-road vehicles. Now they are status symbols. It's not about marketing, it's about economics. For cars with very large production runs, it's cheaper to build less, more luxurious variants than it is to split production between multiple lower and higher cost variants. Take this example pulled out of my hat: say VW is procuring 10 thousand rear view mirrors. VW can buy 10 thousand heated rear view mirrors at $10 each, or 5 thousand non-heated mirrors at $8 each plus 5 thousand heated at $14 each. So, if VW wants to make heated mirrors an option, it's average cost of mirrors is $11, which is 10% more expensive than the average cost of $10 per mirror if all mirrors are the heated luxury type. The economies of scale don't work out the same way for the low production runs happening at the high end of the market. Range Rover figures it's doing the market a favor by offering stripped out variants at a lower price for those customers that only value the aesthetics and mechanics. I test drove a Range Rover once. I was at an event where Land Rover had set up up an off road track through the woods and you could drive through it. It was fun - and they sent me promo emails for months afterward, but I'm not in the target market for a Range Rover. However, when shopping to replace a Ford Explorer a couple years, I came to realize that if you're looking at a higher trim model (my aging backside wants heated seats with adjustable lumbar support) then the mainstream brands at that higher trim level are often nearly as expensive as entry level models from the luxury brands (and, due to higher depreciation on the luxury brands, they can be even cheaper on the used market). And I didn't see much difference in features. So, for example, I ended up with a 2014 Volvo XC90 for a bit less than I would have paid for a 2014 Honda Pilot with heated leather seats. I don't know what options I might be missing out on, but the base Volvo had all I wanted, where I would have had to go high end on the Honda (or Ford or Nissan, etc) to get what I wanted. I noticed the same thing applies to, for example, Acura versus Honda - base Acura versus high end Honda are pretty similarly outfitted and very close in price on the used market. I sometimes think about how people decide to fly international business class when a ticket is four or five times the price of economy class yet after about twelve hours everyone arrives at the same destination. Well, the answer could be that while a factor of 4 in cost of almost the same product seems like a lot to us, we need to remember that some people make ten or twenty times the money other people make, and they like to find ways of showing that and spending it. That is exactly what I am saying. If you are dirt poor, you can get a RR dirt cheap w/o all the bells and whistles. A bit like having to buy extra accessories for an Apple so you can hook up external drives etc. The real demise of the Landrover/Rangerover heritage is the fact that you see them in the affluent suburbs but no longer in real rough conditions, where Toyota now rules. Re Tom Dills, you and I have both lived in North Carolina long enough to know that it's not just Range Rovers that don't seem to have working turn signals. I had a conversation a year or so ago with a guy that recently moved down here from up north and he was trying to figure out how to fit in. After a few weeks he simply decided to stop using his turn signal. And yes, the options game on new vehicles is just silly. I once knew an old timer mechanic who had a favorite saying, "That's why I bought a Dodge, it came with wheels and tires already on it". No, I don't think that's whats going on here. What's happening is that Land Rover has made an opportunity for a social climber who requires being seen driving a Range Rover but cannot come up with the money for the whole package. So if she is willing to suffer the indignity of not having any features she can have a Range Rover for ONLY $90,000. I don't know who that may be. Maybe real estate agents who need to differentiate from lower rent agents who only drive a BMW? Mike, you are analyzing this in the wrong way. As Fitzgerald reportedly said to Hemingway, they are different - and they think different. Some of the rich are tight with money. When we lived in New England we knew a bunch of them. One wore the same tie every day that he got free from a business organization he belonged to. Others looked like average Joes and owned ton's of real estate. Much of that money was handed down for hundreds of years. But the "nouveau riche" are the ones that have made it themselves and want to flaunt it, along with the bad seed kids of old money. They want you to know they have - and spend - lots of money. I live in an area with 50+ movie production houses. The flashy cars and houses around here are so common I hardly notice. There are - really! - more Land Rovers and Range Rovers than RAV-4s. And not a few Bentley SIVs. Or the occasional rare bird like this one we saw recently on our evening walk. 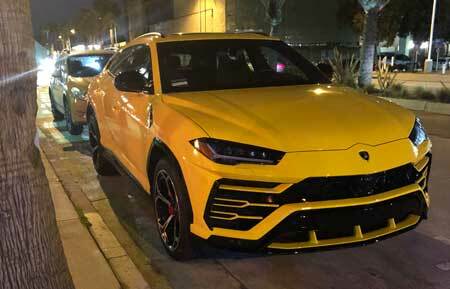 That is a Lamborghini URUS SUV. This costs as much as two Land Rovers and a few RaV-4s. The Bentley is In the same price range. Teslas are now comparable in numbers to Priuses here. In today's society's highly segregated wealth, these cars represent much less percentage of the buyer's wealth than a used RAV-4 would be for you. I actually enjoy how companies like Land Rover, Porsche, Aston Martin, etc. stick it to buyers. It helps redistribute the wealth to some of the blokes who make workers wages building them. And the most pathetic thing is that neither RAV4 nor Range Rover buyers will ever try their cars' off-road capabilities. They buy SUVs because they're big, that's all. The game is played by all car manufacturers, including Toyota. The base trim RAV4 is $25,500, but the top trim (Limited) version is $33,500, an increase of 31%. At about the 9 minute mark in the video, you’ll note where he quickly sneaks in that the RAV4 with all the extras is “under $40k”, but elsewhere he makes it seem like $25k gets you the dream version. The Range Rover, by the way, goes from $90k to $102k with the options he describes, which represents a 13% premium. Regarding the camera analogy, please direct me to the fully loaded digital monochrome alternative to the M Monochrom (which can be bought mint for about $3k these days). The Verge reports this morning that Apple will be happy to charge you $5,200 to add 256GB of RAM to your new $4,999 iMac Pro. For that much you could probably get a nice radio for your Range Rover. I find so much of financial life is contextual. In our zip code home lots (not houses, just the lots) have risen in price to well over a million dollars. Mine has an older three bed room, two bathroom house on it. I like where I live. Should I move out because the property increased in value? I bought the house 22 years ago for a fraction of the price but am I now a "snob" because by sheer dumb luck I live in the "hot" neighborhood? I know I could buy eight similar houses in other parts of the country for the same money but would I want to live there? As for business class flights, to a seasoned traveler the benefits of bigger seats, better food, more space and more perks would certainly be worth the expenditure; especially if the price of the ticket can be billed back to the client or the business the traveler works for. Not everyone is traveling "on holiday." Certainly the majority in transatlantic biz class are not doing do on their own dime. But let's cut to the chase and look at real statistics. The most popular daily driver of the the largest plurality of millionaires in the USA is.....the Ford F150 pick up truck. Hardly a status symbol. I imagine that most of us here use DSLR style cameras and we count ourselves lucky to have a late model, full frame something or other but I'm betting that everyone here (with one or two exceptions) would be busy justifying their purchase of a 100 megapixel medium format system if we lucked into an extra million or two dollars, tax free. It also plays into the delivery time line, particularly here in Australia. Whilst Range Rover are able to advertise the car a s being priced "from $89500", you try finding one on the dealers lot at that price. If you really only want to spend that much you'll be waiting a few months to get it. Most people will take a few options they don't want for the convenience of driving away straight away. So would this make my e-m1x a Miata Rf with all the extras plus rims and a wide body kit?